The recognition program honors women who have helped make improvements within their companies and among their peers. Plant Services and its parent company, Putman Media, are teaming up again to honor women who are helping effect change in manufacturing. Now in its second year, Influential Women in Manufacturing seeks to highlight all women in manufacturing roles – at all levels within the organization. But we need your help to make that happen. Between now and March 31, 2019, we'll be accepting nominations via this nomination form. Q. How do you define 'works in manufacturing'? A. We consider any woman who works in a company that manufactures or produces something to be a woman in manufacturing. Whether she works in R&D, HR, Finance, plant floor, etc. she qualifies. Our 2018 Honorees ran the gamut across all segments of manufacturing and production. We had an industry leader at one of the largest technology companies in the world, a professor of Engineering, as well as to the VP of Operations at Gorton's Seafood, among others. Q. Can I nominate more than one woman? Q. Is this limited to the U.S. only? A. No, you can nominate a woman working anywhere in the world. This is a global program. Q. Does it cost anything to submit a nomination? Q. While I think of who I can nominate, where can I learn more about this program? A. Head over to the Influential Women in Manufacturing website. A. E-Mail us and we'll answer whatever questions you have. In April, a small team will review all of the nominations. Based on nominations provided, we’ll begin reaching out May 1 to those who we feel best embody Influential Women in Manufacturing. A special e-book, published in summer 2019, will highlight the women and the influences they’ve had in the industry. You can see the 2018 Influential Women in Manufacturing E-book here. 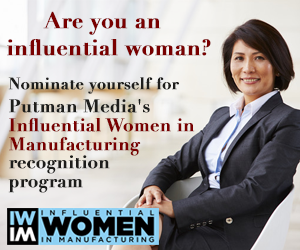 How does one nominate an Influential Woman in Manufacturing? Age is no limit and she can serve at any level of the manufacturing organization, from plant-floor technician to finance phenom, human resource hero, or even C-suite officer. Peers and business associates are encouraged to submit nominations. You can learn more about the program and see last year's honorees on the Influential Women in Manufacturing website.